The User portal log page displays information about users who have accessed user portals. Auditing information about changes to user portal accounts is also included.  Go to Reports > Logs > User portal. • Time — The time the log entry was made. • Action — The action the user performed within the user portal. • Username — The username of the user logged into the portal. • Group — The group the user belongs to. • IP address — The IP address the user was using when they accessed the portal. • Message — The user portal log entry. If required, you can filter the user portal log according to Month and Day. 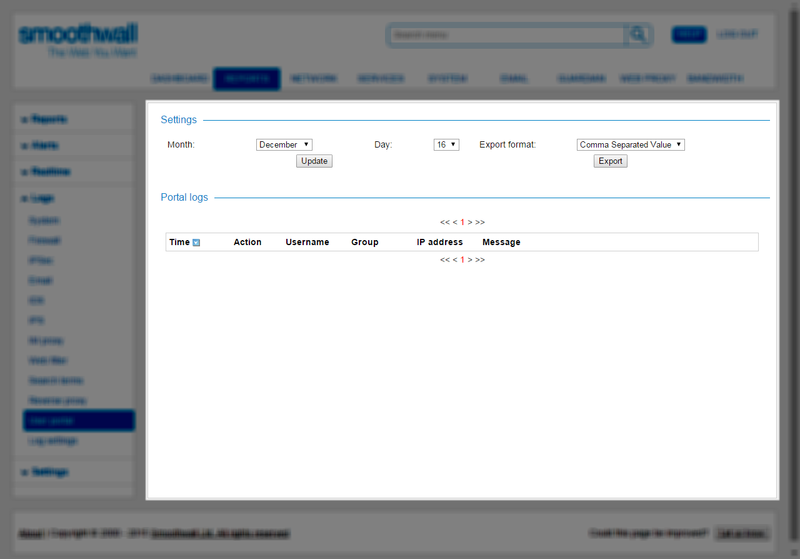 You can also choose to export user portal logs to a chosen format. 1. Go to Reports > Logs > User portal.